Dependency Injection Principles, Practices, and Patterns teaches you to use DI to reduce hard-coded dependencies between application components. You'll start by learning what DI is and what types of applications will benefit from it. Then, you'll work through concrete scenarios using C# and the .NET framework to implement DI in your own projects. As you dive into the thoroughly-explained examples, you'll develop a foundation you can apply to any of the many DI libraries for .NET and .NET Core. Dependency Injection (DI) is a great way to reduce tight coupling between software components. Instead of hard-coding dependencies, such as specifying a database driver, you make those connections through a third party. Central to application frameworks like ASP.NET Core, DI enables you to better manage changes and other complexity in your software. 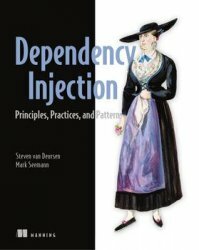 Dependency Injection Principles, Practices, and Patterns is a revised and expanded edition of the bestselling classic Dependency Injection in .NET. It teaches you DI from the ground up, featuring relevant examples, patterns, and anti-patterns for creating loosely coupled, well-structured applications. The well-annotated code and diagrams use C# examples to illustrate principles that work flawlessly with modern object-oriented languages and DI libraries.